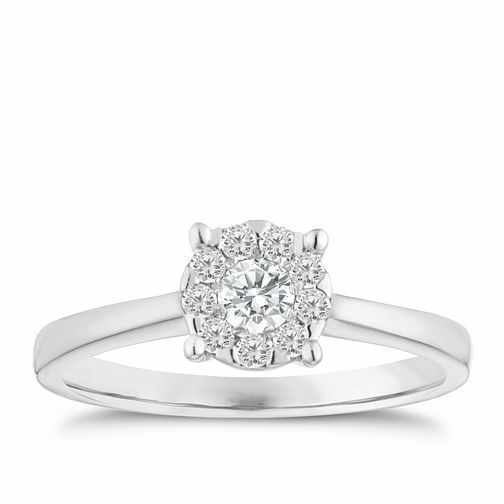 9ct white gold 1/4ct solitaire cluster ring is rated 5.0 out of 5 by 3. Rated 5 out of 5 by Anonymous from SPARKLER ;-) Bought this ring together with my fiancee. Did not need much time deciding on it together. Its a lovely size, it sparkles like mad and am very very happy with it. As the other lady writes, it gives the illusion of a much bigger sparkling diamond than the price would make you believe. How wonderful is that ? Rated 5 out of 5 by Anonymous from This ring really sparkles. Stunning, absolutely delighted with it. Beautiful.